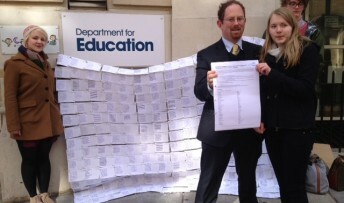 Cambridge University Students Union joined MP Julian Huppert today to deliver 1,600 signatures to the Department for Education, urging Education Secretary Michael Gove to rethink his plans to reform the AS exam. The CUSU team travelled from Cambridge to Westminster today and presented the petition to Michael Gove, the Secretary of State for Education, at the Department for Education. 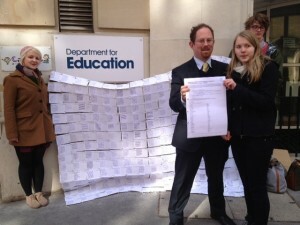 Cambridge MP Julian Huppert met the student campaigners at the DfE to lend his support. He said: “I am very concerned by these proposed changes. It is right that we give students the opportunity to really think about what they are learning, rather than just constantly assessing small components. Vicky Hudson, CUSU Access Officer, said “We believe that fair admissions to university will be jeopardised by the loss of AS levels as they currently stand. Good results in their end of year twelve exams give students the confidence to aim higher. This is particularly important for students who, like me, are first in their family to aim for higher education, and those from non-traditional backgrounds. “Many of the students who signed our petition added their personal testimonies about how their AS results gave them the confidence to see Cambridge as a realistic ambition.